I returned from Florida on Monday night, April 22nd. Thanks for all of the well wishes. We had a wonderful time. it is also good to be back and teaching, writing and playing piano again. Our plane took off 1/2 hour after the bombs went off in Boston (20 minutes from where I live) so we were lucky to get out but also happy to be home in the city that I love with people who are now beginning to heal. The DVD that I have been working on is all recorded. The graphics are done and I am just waiting for the duplications to arrive! In the meantime, I am taking advance orders. You can order your copy now (they will be mailed out in two weeks). I am very excited to introduce this to you!! 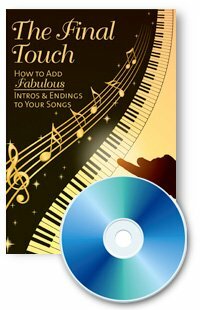 This DVD - The Final Touch - How To Add Fabulous Intros and Endings to Your Songs contains twelve lessons, six intros and six endings. It includes great chord progressions, blues endings, the Duke Ellington ending, using the "circle" and lots more information to put the final touches on your masterpieces! Talk soon. I hope you are doing well.